The Wild & Scenic Film Festival hit the Tower Theater on Earth Day. Started in 2003 by the South Yuba River Citizens League (SYRCL), the touring Wild & Scenic Film Festival made its stop at the Tower Theater this Earth Day. Consisting of 12 short films, the festival’s goal is to bring communities together with local and global issues that affect us all. These films show the challenge facing our planet and the work communities are doing to protect the environment and everything that goes with it. SYRCL’s goal is to make a call to action with the Festival, in the hopes that we all become inspired to go out and help protect mother Earth and our local community. First up, Earthbook, a witty take on Facebook and the human interaction with planet Earth. Told entirely through the Facebook—I mean, Earthbook—app, we watch as a meteorite pokes a dinosaur. Humans spring up and send Earth a friend request. Earth begins to complain that the humans are treating her poorly only to have planet Mars give her an “I told you so.” Funny and intelligent, Earthbook was a delight. Love In The Tetons is a love story set in—where else?—The Tetons. Telling the story of Juan Martinez, a troublemaker who gets a chance to go out to the Teton mountains as part as a urban youth in the wilderness program. Martinez falls in love with the outdoors and, as an adult, he meets his future wife, Vanessa Torres. They get married in the open wilderness of Grand Teton National Park. Beautifully filmed, we see the park in all its glory and two people who are madly in love with both each other and the wilderness. A Line In The Sand is an animated mash-up of Edward Abbey quotes, speeches and articles collected over the years. Abbey, for those unfamiliar, was an American author who was noted for his essays on environmental issues as well as his criticism of public land policies. This was a bold, loud film that provoked feelings of angst as Abbey spouts off about land being commercialized left and right. Abbey was a provocative man and this short is no different. Bounce – This Is Not a Freestyle Movie is the chronicle of director and star, Guillaume Blanchet and his two-year journey as he bounces a football on his head in many different countries and continents, sometimes with the help of locals—a happy little short that goes to prove that football is one of the most popular sports in the world, something that connects us all. The Edge Of Impossible tells the incredible story of Tony Schmiesing, the first quadriplegic to heli-ski the rarefied backcountry of the Alaskan Chugach Mountain Range. With the support of his amazing team, including Roy Tuscany of High Fives Foundation, Schmiesing shows his day-to-day routine and what it takes to get him prepped for a day on the slopes. The Edge Of Impossible shows what a person with sheer will and determination can do when they have the drive. An inspirational tale of never giving up on your dreams, no matter what life throws at you. Ever wanted to watch a snail crawl across the screen for two minutes? Well now you can in The Curious Snail. Director Alex Jones drops some quick and fun facts about snails as we watch one do its thing. This is a fun film that doesn’t take itself seriously and tries to show how something as mundane as getting a drink of water could be a great adventure for a certain species. 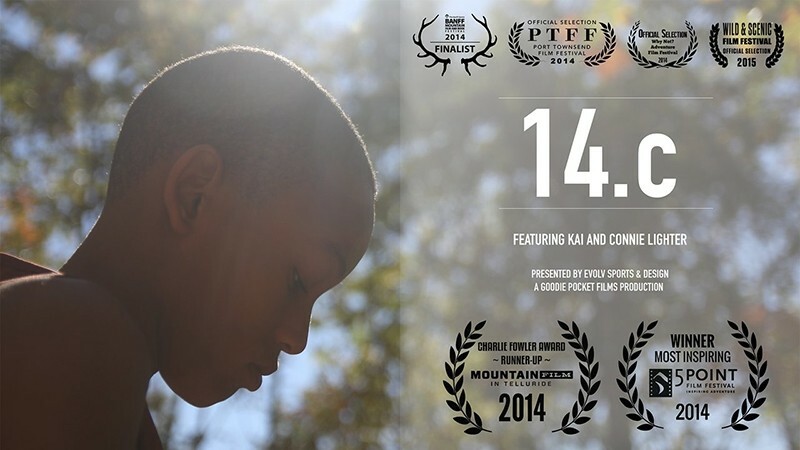 Kai Lightner entered the competitive world of indoor rock climbing at age six. Now at 14, Lightner is taking on more difficult routes and gradually expanding into outdoor climbing. 14.c is the story of the young Lightner and his single mother as they balance out a day full of school, homework and climbing. Ever the doting mother, Connie gives constant love and support to Lightner as he excels in school and the ranks in climbing completions. A sweet film showing the bond between mother and son, 14.c will inspire you to do more with your life after watching all that this young man has accomplished. River Of Eden is the story of how the locals of the Fijian Highlands said “no” to easy money from resource extractions and instead turned to tourism to fund a conservation area that protects one of the most beautiful rivers on Earth. They’re not lying when they talk about this river’s beauty. It really is a sight to behold. This short could practically serve as a tourist aid on its own. With beautiful, sweeping shots of the gorgeous island of Fiji, River Of Eden goes to show that money isn’t everything. We need to help conserve what really matters—our precious resources. Spaceship Earth Passenger Safety Briefing is a funny, CGI-heavy take on airline safety procedures. The Earth Passenger flight attendant and pilot talk to the audience as if we are all passengers of spaceship Earth, giving excellent examples of things every one of us can do to make the planet a better place. The CGI was hokey, adding even more humor than I believe was intentional, however, none of this took away from its positive message about peace and love for mother Earth. This would have been an excellent opener film to the Wild & Scenic Film Festival, one that I enjoyed. Artic surf. Those are two words that I never thought would be connected. In Catch It, Lea Brassy proves otherwise as she trades in her bikini for a wetsuit and surfs the freezing cold waters of Lofoten Islands in northern Norway. Living a simple life out of a van, Lea proves that sometimes in life, we have to take the bull by the horns to have the fun that we all want. Catch It showed me a life that I never knew. I thought surfing was done only on bright, sunny and sandy beaches. Brassy shows that wherever there are water and waves and a determination to surf, the only thing that is stopping you is yourself. I Heard is described as, “A Seussical glimpse into more than 110 million acres of designated wilderness.” Celebrating the 50th anniversary of the Wilderness Act, I Heard features a wonderful rhyme sung by different children as the viewer watches some of the country’s most iconic places and creatures. Short and breezy, this film was a nice little melody that I enjoyed. Last but not least was my favorite of the Wild & Scenic Film Festival—Bluebird Man, which focuses on the efforts of a single 91-year-old, Alfred Larson, who has been looking over and maintaining 300 nest boxes for bluebirds in Idaho for over 35 years. With rival birds kicking the bluebirds’ asses in the ’50s, ’60s and ’70s, a group of concerned scientists and bluebird lovers formed the North American Bluebird society, hell bent on getting the birds back on track, Larson being one of them. I loved watching Mr. Larson talk candidly about getting old and not wanting to waste away his golden years in a La-Z-Boy—he’d rather help out the species that he so obviously loves. The film also showcases the group’s efforts to spread the word to a younger generation in hopes that they can one day find a replacement for Larson. Touching and funny, The Bluebird Man was a wonderful film that could also work well on its own, outside of the festival. Going on for one more day in Park City, the Wild & Scenic Film Festival comes to a close for Utah on April 24, with it’s next stop in Exeter, New Hampshire. I found the festival to be a delight to the ears and eyes, bringing attention to issues I would normally never know of, and showing touching stories that inspire me to do more for my community. I look forward to the next time the festival comes to town, and so should you! The Wild & Scenic Film Festival got its start in 2003 by the South Yuba River Citizens League in the foothills of the Sierra Nevadas. Their goal: to put a human face on the environmental movement. After the films premiere annually in Nevada City, California, the festival—with the help of sponsors and individual organizations—goes on tour to communities across the globe. This is the 7th Annual Wild & Scenic Film Festival Utah has seen and, while typically held in Park City alone, it has since leaked into the Salt Lake Valley with a partnership between the Park City and Salt Lake Film Societies. Organized as a benefit for the Summit Land Conservancy, a non-profit based in Summit County dedicated to saving local lands, these films are curated with the hope of inspiring wonder at our natural resources, as well as action to help protect the planet we live on. The second day of the Wild & Scenic Film Festival started out with a short film entitled Earthbook—a desktop point of view of Earth using social media to document the history of the planet we inhabit. After the dinosaurs pass and humans begin to over-populate, Earth “chats” with Mars, gets “poked” by meteorites and adds animals to “Endangered Species” groups. Pending catastrophe raises Earth’s stress level (and temperature), but there’s a change in human attitude that eventually mends the course. While the ideas in this film were clever, the film might have been better received in an elementary school classroom, and came across like a commercial with cheesy jingles for the soundtrack, making it feel pretty old school despite it being a fairly up-to-date Facebook interface. Adventures With a Purpose: A Higher Calling, put together by Teton Gravity Research, took a unique idea to inspire easy action. Once we are introduced to the main characters of this story—Jeremy Jones, snowboarder and creator of the “Protect Our Winters” campaign; Ryan Mayo, Clif Bar rep and outdoor enthusiast and Gregg Treinish, National Geographic’s 2008 Adventurer of the Year—we begin to learn their philosophies and thoughts on what the outdoors means to them, and what to do with that meaning. Recognizing that it’s usually a selfish pursuit that takes you outside, Treinish decided to come up with a way that people can give back to the places they play in an attempt to keep protecting those areas. By training outdoor enthusiasts to gather scientific data, explorers can be in the field doing much-needed footwork for the scientific community in their studies of the effects of climate change. To propel this idea into motion, Jones decided to participate by gathering samples of glaciers from the Himalayas to assist Natalie Kerhwald, a scientist at the University of Venice, who needed the data to explore the impacts of human nature on glacier growth and replenishment. In many ways, Montana is America’s final frontier, holding vast expanses of wilderness unmatched in any other state. With over 400,000 acres of public land that spans across the Rocky Mountain front, along with pristine rivers and forests through the Bob Marshall Wilderness, locals struggle with how best to maintain that space, from development to conservation. Common Ground takes a look into the lives of the ranchers that have inhabited the area for generations, and asks what the land means to them. While most ranchers are fairly straightforward with their philosophy of conserving the land they’ve worked on their entire lives, they offer valuable perspective in the fight over the Heritage Act. Landscape painter Stoney Burk offers the most emotion when he changes from talking about his thoughts to ask the audience who speaks for the rivers, the cliffs and the baby fawn, reminding us that we are the ones that can speak for the wilderness, and therefore have the power to protect it. Taking a break to partake in a visual feast, The Ridge with Danny MacAskill takes us to the Black Cuillin Ridge in the Cuillin Mountain range in Scotland. We follow him on bike as he traverses through some seriously gnarly terrain. MacAskill’s name implies his biking talent, made evident as he hops through cliffs and jumps over rivers, all on wheels, making it seem like it would have been just as easy for him to walk through the Isle. The combination of the filmmaking with the challenging traverse and the magnificence of the Isle of Skye left me with a sense of awe and vertigo, making this some of the best action filming I’ve seen in a while. Being at an environmental event in Utah, I usually expect Utah author and environmental activist Terry Tempest Williams to come up in some way, shape or form. The Wilderness Act: 50th Anniversary, put together by the Sierra Club, gave her a cameo alongside Tom Udall (New Mexico senator and son of Stewart Udall, former Secretary of the Interior and champion for conservation legislation), Daniel Wildcat from the Haskell Indian Nations University and Michael Brune, president of the Sierra Club. The Wilderness Act was signed into legislation 50 years ago, and the interviewees take a look at the idea of wilderness, conservation and the way we use our resources to create an environment that reflects the freedom we are so adamant about protecting in America. While inspiring one-liners were spat and the idea of wilderness being honored in the government is presented, the film felt like Sierra Club propaganda, and could have used a more interesting narrative than personal anecdotes. The longest film of the Wild & Scenic Film Festival (at a whole 36 minutes), and one of the most impactful for me personally, School’s Out: Lessons from a Forest Kindergarten still populates my thoughts and has me scheming of ways for myself to enroll (I know I’m not a toddler anymore, but a girl can dream, right?). Outside of Zürich, Switzerland, kids ages 4–7 are given the option to spend two years in an outdoor classroom in the nearby forest, where they spend every day in their outdoor playground, no matter the weather. The curriculum stays pretty loose: when they arrive at their destination the class typically sing a song, and then they are given the rest of the day to play and explore. Unlike American public schools, with strict schedules and a school day spent almost entirely indoors, there is no reading, no math and no tests. (FYI: Children don’t start reading and writing until age 7, and they catch up to Americans by age 10). This way, the kids have a chance to develop social and motor skills in ways that indoor schools lack—students learn by making their own mistakes, by climbing and crawling through their environment, and lack the fear of retribution if they misbehave or don’t study. Not only are kids taught useful outdoor skills, like how to use knives and start fires, but despite the brutal winters in Switzerland, none of the parents reported an ill child. I want everyone to watch this film, and I really hope that this idea spreads across the Atlantic to our country; but what I really want is to go to my own outdoor school for two years. Can we make this happen, America? You deprived me in my youth, but it’s not too late to make amends. The Wild & Scenic Film Festival concluded with the film I Heard, another visual treat narrated with a poem recited by two kids, Finela Guy and Oliver Lamond Ramsey. Filmmaker Michael Ramsey guides us through the variety of lands we celebrate in America, inspiring amazement at all we have to offer in the US. Find out more information, and stay tuned for next year’s event by keeping up to speed at wildandscenicfilmfestival.org. For more information about the Summit Land Conservancy, visit wesaveland.org.